This year’s Darkness into Light event will take place on Saturday May 11 at 20 venues throughout Ireland, with one of the events taking place in Westport through the grounds of Westport House. 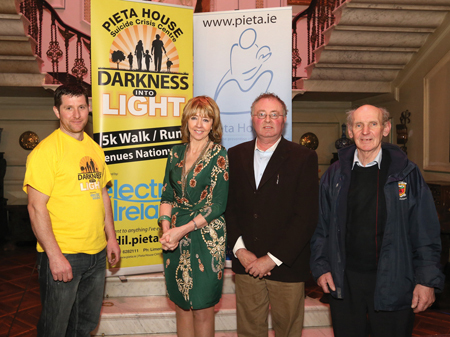 The 5k fundraising walk/run in aid of Pieta House, the suicide and self-harm crisis centre, begins in darkness at 4am on Saturday May 11 and ends as dawn is breaking. At the launch of the event which took place on Monday in Westport House, Joan Freeman, CEO and founder of Pieta House, said that over the past six years the Pieta House centres throughout Ireland have helped some 4,000 people, with the majority of funding for these centres coming through fundraising. Shockingly, Ms Freeman said that by “this time next week 10 more people will take their lives, and eight of them will be men”. Money raised from events such as Darkness into Light help fund more therapists and help local communities. Ms Freeman said that her mission is to reduce suicide in Ireland, provide suicide and self-harm support services within 100 kilometres of everyone in Ireland, and bring about social change.